Wasps are a well known pest around bees and over this season I have seen this first hand. Wasps continuously attempting to find ways into the hive and also predating on weak bees and pupae on the ground in-front of the hive. Recently, when I stopped feeding and the weather turned bad, the bees started evicting drones and throwing out pupae. The wasps were all over them as they were dumped or driven from the hive. It was not a pleasant sight – but I guess that’s the way nature works. 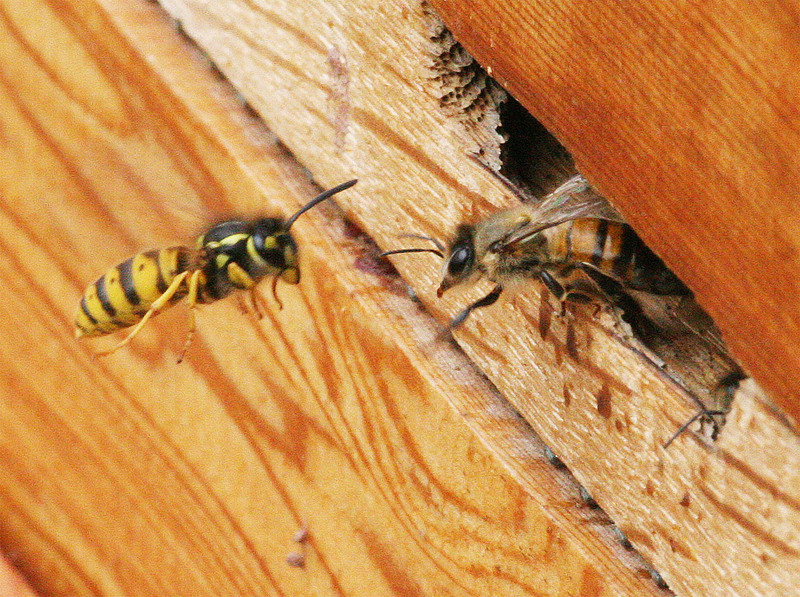 Its September now and the hive is definitely under more persistant attack from the wasps. Fortunately, with the combination of a small entrance and a seemingly strong hive, the bees appear to be successfully keeping them at bay. 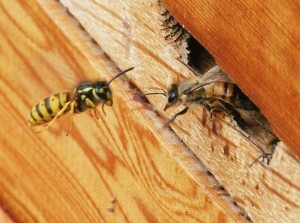 I have seen a couple of wasps sneak past the guard bees, through the entrance into the hive. I wonder if they ever make it out again? This entry was posted in Pests & Disease on September 11, 2013 by george.